CEREC is one of the most time efficient advancements in dentistry today. Previously, if you needed a crown, it would require a number of appointments. Now, with our Digital Dentistry Technology known as “CEREC”, we can complete a crown in one appointment, saving you much needed time. CEREC is the short term for CEramic REConstruction. CEREC uses CAD/CAM (computer aided design/computer aided manufacturing), basically, it’s technology that quickly takes digital impressions more comfortably and generates a precisely fitted crown, bridge or veneer in one appointment. Many dental labs have been routinely using this technology for years and if you currently have a crown in your mouth that was placed in the last 15-25 years, you may have already experienced the benefits of these advancements via CEREC. No impression material or tray – which means no gagging! The result will remain for years to come, just like ceramic restorations from the laboratory. Learn more about CEREC by visiting our Commonly Asked Questions page. Have you ever cracked a tooth, required a root canal or lost a large filling that has left your tooth broken or misshaped? If you have, then you’ve likely needed a crown and experienced the process of having impressions, a temporary crown and multiple appointments. With new dental technology, we can complete your crown from start to finish in just one simple visit! Never feel like you have to miss out on everyday things because of your teeth. If you have a trip coming up or a special occasion this is definitely going to help you! What is a dental crown and how long should it last? A crown, sometimes known as a dental cap, is a type of dental restoration which completely caps or encircles a tooth or dental implant. Crowns are often needed to support remaining tooth structure when a large cavity compromises the integral strength of a tooth. Crowns are strong and generally last for about 10 years or longer if you take good care of them. Like your natural teeth, it is recommended not to bite down on hard objects or use your crown to open or cut things. To extend the life of your crown brush and floss it, just like you clean your natural teeth. There are 2 big differences that have occurred with the advent of digital dentistry and CEREC crowns. First we have been able to replace our traditional method for taking impressions of a tooth using a cumbersome tray to using a sleek 3D Scanner that records the tooth and surrounding tissue with extreme accuracy. The 2nd difference is time! CEREC crowns can be made right here at the office in a single appointment, whereas crowns that are fabricated off-site at the dental lab will take several days to 2 weeks before they are back at our office and ready to be inserted. Today, both dental labs and CEREC offices use identical materials when making most ceramic restorations. 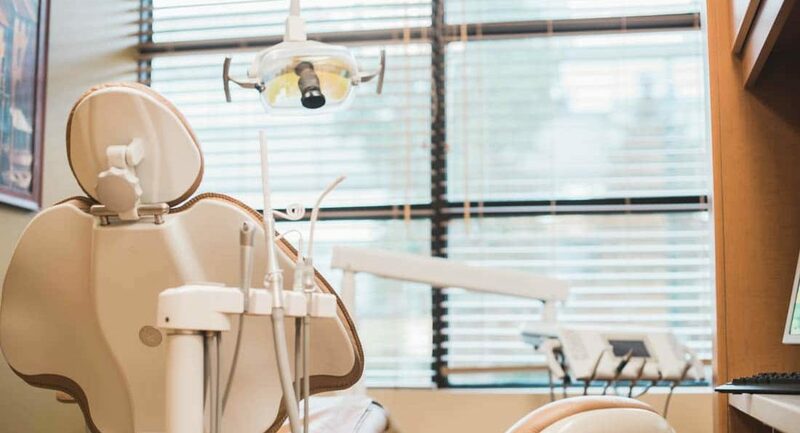 Even when dentists use traditional impression materials, most labs use 3D scanners to convert the models into digital format to design and mill the crowns, bridges, or onlays. Now at NOVO Dental Centre, your tooth will be prepared in the same way except, and here is the best part, instead of having to take a messy impression of your tooth with a cumbersome tray we will now use a special 3D scanner that will capture an optical image of your tooth and turn it into a 3D image on the computer screen right beside you! Dr. Provo or Dr. Nada will then design your new crown for a precision fit. The specific design details are then sent to the milling chamber in our office where the pre-shaded ceramic block is inserted. Depending on the material selected the milling of your new crown will take 9-20 minutes! When the milling is completed the crown will be custom shaded (if necessary) and glazed and placed into the firing oven for final hardening. Once cooled your new crown is ready to be inserted. The entire process takes approximately 2 ½ – 3 hours and is typically completed in one appointment. While you are waiting for the milling and firing to complete you may read, watch a movie or catch up with paperwork or emails. The time savings are a vast improvement over having to wait 10-14 days with a temporary crown in your mouth while the dental lab fabricates your permanent crown. 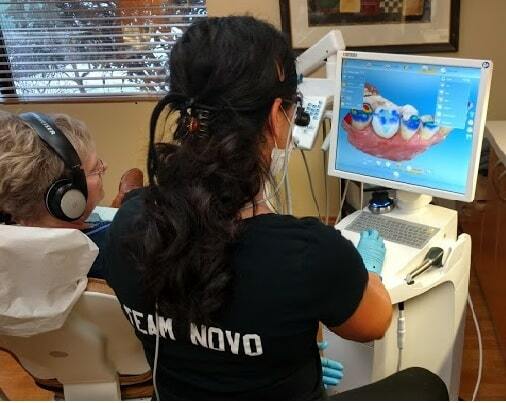 Talk to NOVO about the CEREC System! If you need restorative or cosmetic dental services to help achieve the smile you’ve always dreamed of, contact us today and we will help you find the best treatment options to meet your dental goals.